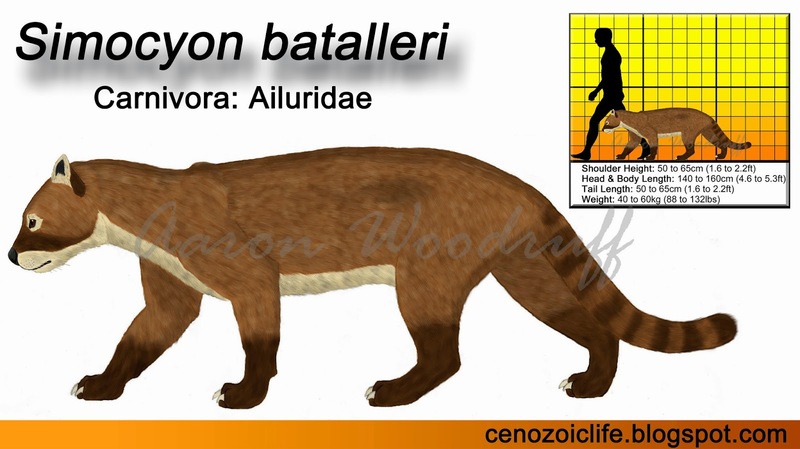 Bataller’s Panda (Simocyon batalleri) was a Leopard-sized, predatory relative of the living Red Panda (Ailurus fulgens) that lived in Spain during the middle to late Miocene (12 to 9mya). It is one of only two fossil ailurids for which the majority of the skeleton is known, the other being the North American Bristol’s Panda (Pristinailurus bristoli). This animal was originally described as Cephalogale batalleri by Viret in 1929 who mistook it for a type of bear. Since then it has been recognized as a member of Ailuridae and placed in the genus Simocyon. The name Simocyon is a combination of the Latin simus, meaning “flat-nosed”, and the Greek cyon, meaning “dog”. The species is named for Dr. Bataller who discovered the holotype; a right maxilla* exposed during the construction of a railroad in Catalonia, Spain. Thus, fully translated the binomial name means “Bataller’s Flat-nosed Dog”. For this blog, I will be referring to this species as Bataller’s Panda. Bataller’s Panda is known only from several Vallesian* deposits in Spain and is particularly well-represented at the Batallones-1 site in Madrid. During the middle Miocene, this locality was a subtropical environment with wooded areas and patches of grassland. Such habitat provided Bataller’s Panda with a diverse and abundant variety of prey and trees in which it could retreat to escape any of the more powerful carnivores with which it coexisted. Together with the North American Bristol’s Panda, Bataller’s Panda is one of only two fossil ailurids for which enough of the skeleton is known to create a full-body reconstruction (my reconstruction is based off of skeletal drawings done by paleoartist Mauricio Anton, click here to view his blog). This animal was comparable to a Leopard in terms of his size and body proportions; explosively fast and agile on the ground while retaining a suite of characteristics that made it a highly adept climber. Notable climbing adaptations include powerful muscles in the shoulders and lower back, wide paws with dexterous forelimbs, recurved claws, and a counterbalancing tail. A flexible spine, long hindlimbs, and semi-plantigrade feet enabled long strides while running and produced the necessary thrust to propel it up vertical surfaces. Like the Red Panda, Bataller’s Panda also possesses a modified radial sesamoid bone called the “false thumb” or “panda’s thumb” which enhances its ability to grip tree trunks and thin branches. It must be noted, however, that because of its mainly terrestrial habits the false thumb in Bataller’s Panda is proportionally much smaller than that of the Red Panda which spends the majority of its time in the trees. The overall body plan of the extinct animal implies a scansorial* existence, foraging at ground level while readily taking to the trees when necessary. There are two distinct lineages within the Ailuridae. The lineage containing the living Red Panda (Ailurinae) show a marked trend overtime toward hypocarnivory* with its more derived members possessing molariform* cheek teeth adapted for crushing plant matter instead of slicing meat. 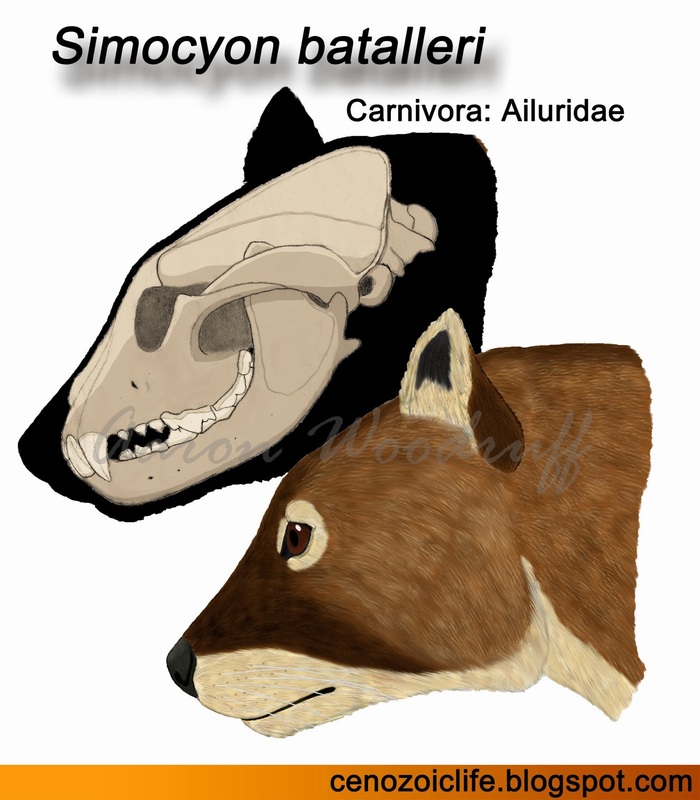 In contrast, the now extinct lineage containing Bataller’s Panda (Simocyoninae) show a trend towards hypercarnivory*. The dental formula for Bataller’s Panda is 3/3, 1/1, 4/4, 2/2 = 40 teeth. The overall form of the dentition itself is very similar to that of a wolf, placing a strong emphasis on shearing and crushing. Small canines and a low, narrow snout suggest that this predator likely specialized in taking relatively small prey items. The skull becomes exceptionally broader about the carnassials* and a well-developed sagittal crest* is present, providing attachment area for massive jaw muscles. This mixture of features shows that Bataller’s Panda was an active predator that would catch and kill animals its own size or smaller. With its powerful jaws and teeth, it was then able to consume these carcasses in their entirety, bones and all. Bataller’s Panda was a mid-sized predator that targeted relatively small prey like rodents, rabbits, and small ruminants. This meant that it did not directly compete with the big cats and bear-dogs with which it coexisted. It was not built to run at high speeds for extended periods, and therefore would have relied on a cat-like stalk-and-pounce hunting technique. Like most predators, Bataller’s Panda would have also readily scavenged meat from found carcasses. This is the likely reason why such exceptional fossils of Bataller’s Panda and other contemporary predators have been found at the Batallones-1 site. This site was once an underground cavern whose entrance led to a sloping, slippery-walled passageway before abruptly widening into a larger chamber. The sheer volume of predator remains relative to herbivores suggests that this was a carnivore trap. Prey animals would occasionally fall into the pit and were unable to escape. The sounds or smells of these trapped animals would in turn attract predators, many of whom were able to descend into the pit with relative ease but would then find themselves unable to climb back out. Hypercarnivore: an animal whose diet consists of more than 70% animal matter. Maxilla: one of the bones that (in mammals) comprise the upper jaw and palate. Scansorial: an animal that is adapted for climbing yet spends most of its time on the ground. Vallesian: a period of geologic time spanning 11.6 to 9mya (European Land Mammal Age).